As a coastal sea kayaker I want access to as much data as possible when I am paddling. For the Inside passage I used everything I could get my hands on. I started with the NOAA marine charts downloaded for free. Big charts end up folded and inside a chart case, but recently NOAA made a new product available, booklet charts. Which are the same charts made available in 8.5 by 11 format. Perfect size to be printed and used on the deck of a kayak. The marine charts give a lot of information on the water, but frankly, I really don't ned to worry about where shoals are - shoals that would cause problems for a ship, aren't too much of a concern for paddler. They do give current info, and great information on harbors. For Alaska I also purchased and printed topo maps from National geographic TOPO! A great resource. I was able to create and print PDF files with topo data. I like the topo data because it is great at figuring out where landable beaches are. My big concern when I am paddling is being able to get off the water when I need too. 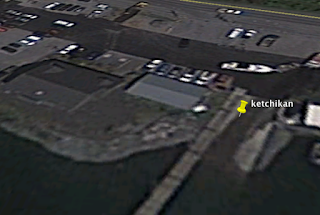 I used both of these on the inside passage, but I used google earth before I left. Google earth was instrumental in the planning process. Being able to actually see where I would be paddling is amazing. It offers topo information without having to decipher topo lines - a lot of people have a problems with that - and I can easily see routes and landings, crossings, and speaking in general terms options. You always have to work a little to make maps read in your head like the real world. Google earth takes this out of the process. It is the real world. This illustrates how fundamental google earth was before doing the inside passage. I knew I would have to get off the ferry, with my boat on wheels. I would then have to walk to the harbor masters office to store my boat for two days. With google earth (and google maps street view) I was able to 'walk' the route from my living room. Looking at land marks, and seeing what the harbor masters office looked like. The building in the center of the photo is 'the shed' where my boat was stored. The yellow pin is the boat ramp where we launched from. Like always, it isn't perfect. My biggest complaint with google earth, or any of the google earth clones - Garmin has birds eye for its devices - is you are seeing a snap shot. One slice of time. I would really like to be able to pick a location and scroll through 24 hours. Particularly as a paddler it would show me how the landform would change with the tide. The world looks very different at low tide than it does at high tide. Second, I would like three dimensions. In google earth land forms have altitude data, so you can see all three dimensions, but as you can see in the photo above those buildings are a two dimensional representation of a three dimensional object. To do this you would really have to take pictures of the same location from different angles. This would give so much more information. Third, and this is a tough one, I want to be sitting in my cockpit, with my iPad in a waterproof case, looking at my exact location on google maps. Here is the kicker, I want it in real time. I want to see the top of my own head, and my red kayak in good enough resolution to identify it. I want to be able to wave to myself! No one would ever get lost again! I can't imagine the number of satellites this would take to make happen, but this would be the holy grail of navigation. I suspect this technology exists for individual places on the planet. For instance, I am sure if the director of the CIA wanted to watch me paddle the inside passage in real time from a satellite, he could. But I don't think they are going to be sharing that technology with the paddling community any time soon. But this is still the king. May all the bears you run into be this nice. The last one I ran into was almost this nice. Is it the end of paper maps? Several months ago I railed against the editors of backpacker magazine who claimed it was time to leave behind paper maps and just load all your data onto a tablet and access it that way. At the time I stated that there were so many problems with the thought process of the editors it was ridiculous. In the proceeding months though a number of things have changed. I need to stress that when people ask me what I do with my cell phone when I am paddling I tell them this. It goes in a crush proof, and waterproof case, inside a dry bag. It is also turned off. If I need it I have it, but I don't want to be disturbed by it. I go to the outdoors to get away from people and contact. I don't want my phone to get in the way of that. With that in mind I have also described electronic products I would like to see in the outdoors. One that is an electronic interface with a paper map, and another that provides a heads up display inside sunglasses. So I am not opposed to electronics. But a tablet taking over for paper maps and charts is a very big step. A step that I thought might be underway when I saw the move that National Geographic maps has undertaken. They have done away with their TOPO! line of digital maps on DVD. I used TOPO! Alaska when planning and paddling the inside passage. You now buy this, and it gives you access to a website. The website is a combination of Alltrails.com and National Geographic's wonderful TOPO! maps. Essentially you can scroll, zoom, or drag to anyplace in the US and create digital maps. You save them as a pdf and when you print them the edges get lat/long as well as a scale and declination on the bottom. You get to choose from several views. The two most useful are TOPO! (topographical maps that you can zoom in and out of to get the scale you want) and Satellite (think google earth). It was easy, the maps looked great, and paired with National Geographic adventure paper it makes it easy to plan paddling trips. But it got me thinking. If it was this easy to use and I could slide the maps onto my iPad, the editors of Backpacker may have been right. Simply put my iPad in something like this, and when the battery is dead I an charge it with something like this, or really on an expedition I would want this, and use it to charge camera batteries as well. If only they were waterproof. I suppose I could just create the pdf's on my computer and view them on the iPad as a photo, but this seems inelegant. It should work on the tablet the way it works on my computer. Very disappointing. Now, I am sure someone is saying 'why not just use one of many 'maps' apps on your iPad while your paddling. The problem with that idea - in fact the problem with using your smartphone instead of a hand held GPS - is this. While my devices GPS works fine in the back country, if there isn't cell service I can't get to the internet. If I can't get to the internet I can't get map data to go along with the location information. So it is a bit useless. So is it the end of the paper map. Not yet. But that time is coming, and it's not to far off. ...It will be so simple. Then maybe - if that happens - we shall be in a position to handle our technology with more sense. With love, instead of with hate for our environment. So, that looks pretty cool, $50 and $8.99 a year. But what does this have to do with paddling? Well, why do I have to put it in my luggage? Why can't I put it in a dry bag when I go paddling? I am surmising it uses cellular to communicate, so it will have some limitations in terms of remoteness, but it looks like a simple tracking device that could be used to track anything. Could I attach it to my dogs collar? Could I put it in my wife's jersey pocket when she goes cycling? From what I am reading you can use their website to look at where your 'Luggage' has been, why can't I do that for a day of paddling? The last time I paddled the Outerbanks I had cell coverage for all of it, There were even a few places on the Inside passage that had cell service, and the batteries last 28 days. This looks like something worth delving into deeper. I wonder what else will show up at CES that might be of interest to us? I wish I were a great fabricator of custom kayaks, but that isn't where my best talents are. I learned my fabrication skills on film and photography sets where things only need to look good from one side. So that makes me nervous when I want something to look nice. I also have the bad habit of rushing things. So I was a little apprehensive about the idea of installing a deck compass myself. A local shop offered to install it for me, but I felt that would be anti-climactic. I will say, I am always impressed by the work that Gnarlydog does on his boats. He has talent, and a good eye for innovation. With that said, I really wanted a deck compass installed because of how unhappy I was with my temporary suunto orca compass when I paddled the inside passage. On short trips it had been fine, but with a deck bag in front of me and a gopro mounted everywhere from one time or another, I had little time to play with a good spot for my compass, and whenever I wanted to use it it wasn't sitting level. For this reason I finally made the move and got myself a deck compass. Actually, Santa Claus brought it, it was very nice of him, too. So a couple of days ago I finally got up the nerve to drill some holes in my kayak and make it happen. Here is the tale. First, the negatives. The instructions that come with it and available on Brunton's website range from horrible to non-existent. The compass comes with something more akin to guidelines than instructions. It came with a small brass plate that goes under the plastic square mounting plate, and four brass wood screws. I suspected this system would work perfectly on a wooden dashboard, or maybe even a fiberglass kayak, but I had doubts about it working on my thermoformed plastic Delta. Also, the recessed compass location on my boat was just a little too shallow for the compass itself, so it would have to be raised slightly. Here are the parts I bought to make the installation go smoothly. I already had a screwdriver, a drill, and a matte knife to cut the foam rubber. The bolts were just a little too big for the plate, so I drilled out the plate and the boat at the same time. The boat was on my rack, and I used a strap to hold it securely in place. I didn't want it moving around while I was drilling the holes. Once I got the idea in my head that if I screwed up somehow, I could plug the holes with aqua seal, and most people wouldn't even notice. Piece of cake! four holes. Next came building the sandwich of Plastic mounting plate, compass, brass plate, and rubber shim, with the bolts in place. I left off the rubber for the photo, because it would cover everything else in the photo. But simply add the precut 1/8 rubber and screw feed it through the holes, which since they were drilled with the plate as a guide would fit perfectly. The holes in the deck are just a little bit smaller than the bolts, so I had to screw them into the boat. This was part of the plan, as I wanted a tight fit to prevent leaks. Once screwed through the boat, I attached the nuts from the inside and tightened them up, it pulled the compass flush against the boat. I screwed in so tightly that I doubt I need a sealer, but I plan on running some tests. Here is the view from the inside. One of the reasons I didn't like the idea of the screws, is that the points would be sticking down into my bow storage and could puncture a dry bag. The bolts are better, but I would like to find some form of rubber coating to go over them. Shrink tubing maybe? I never understood the concept of going out and getting really drunk on New Years Eve. Many years ago my wonderful Uncle taught me that New Years Eve is 'amateur hour'. Essentially it is people who don't know how to drink, going out and getting stupid, then hitting you with their car. So I tend to keep it pretty low key on the eve of the new year. I also never understood the idea of then waking up on the first day of new year - which most people view as an opportunity to start fresh, be healthy and good to themselves - hung over. So I don't. I had a quiet night at home with my amazing wife, woke up the next morning feeling wonderful and went paddling. A small group of us braved the cold and wet weather and set forth on a small local lake. The lake was actually closed, but Melissa, a good friend, and new paddling buddy - she is a solid paddler and can paddle with me anytime! - works at the lake at opened it up for us. It was a beautiful day on the water, and the cold and wet only made the post paddle hot chocolate that much better. One of the paddlers going on 'The next great trip' as I have taken to calling it, wants to experience a multi-day trip in bad weather. So in March we are headed to the cost for cold and wet. Planning will begin immediately. If you follow me on Facebook you know that Santa Claus brought me a new deck compass for my Delta, installation notes will be coming soon, along with pictures. Let me just say now, I am not very handy, and it has no real instructions! At the end of January I am teaching a Wilderness First Aid course at REI in Cary, North Carolina. The following weekend I am teaching the same two day course at REI in Brentwood (just outside Nashville) Tennessee. I think these are awesome courses that are offered in through the Wilderness Medicine Institute of NOLS. If you're in the area they are definitely worth the time and money.